Status : In general use by the ACTF. 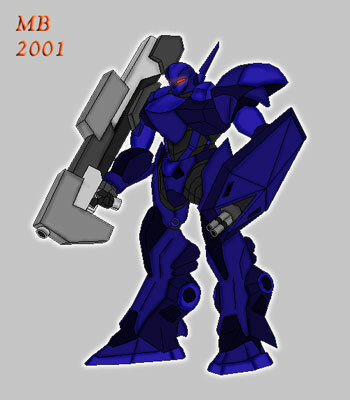 Description : The Blue Type V2 Cybernetic Battle Armour is the second version of the mass produced Blue Type battle armour to have been developed by the U.S. to counter the advantage that even a low level Zoanoid has against the typical human soldier. Possessing superior dexterity, mobility, speed, and strength enhancements than the previous Blue Type Armour. The Blue Type V2 units more than even the odds in the field of battle against all but the more advanced Hyper Zoanoids and Zoalords. Present estimates of the Blue Type abilities have been compiled and summarized below. -Physical strength has been rated to be equivalent to that of thirty men, which makes it twice as strong as the Gregole Class Zoanoid. -Speed: The Blue Type V2 has been enhanced with an advance thruster system, similar to that utilized by the Wolf series armours, that grants this type extensive mobility. Ground speed is 0-30 MPH / Hover speed is 0-200 MPH / Flight speed is 0-300 MPH. -Durability: The Blue Type V2 has a more advance armour design than the previous model. Composite armour has been enhanced with both the ability to polarize itself, allowing armour to better withstand projectile weapons and partially deflects particle based energy attacks, as well as an energy shield system capable of deflecting a Vamore class laser blast. Armour defences have also been augmented with armour shield over units left arm that has vibrational plating that allows it to be used to block vibrational blade attacks when in close combat with zoaforms equipped with that weapon. -Sensory Perception: Armour is equipped with the latest H.U.D. tactical display with auditory and visual enhancers that respond automatically to changing combat situations. Special Note: A energy field strength antenna has been added to the unit that works in conjunction with unit’s shield system to allow for the detection of a cloaked target if it gets in close proximity to the unit but system is presently limited to a one meter perimeter range. -Weapons: The Blue Type V2 Battle Armour is equipped with a variety of weapons including: A double barrelled arm mounted electric gun, located within the left arm’s armour shield, that fires 20mm H.E. caseless armour piercing rounds at a variable 2 to 40 per second re-fire cycle rate; Optional short range guided mini-missile shoulder mounted pods; A jack hammer, armour piercing, wrist mounted spike for close range combat; Eye laser targeting system that is of sufficient power to blind the average Zoanoid, and a plasma pulse bazooka on the right arm. This last weapon is the first mass produced armour mountable weapon module that comes standard with each armour unit. Drawing primary power from armour allows this weapon to fire concentrated bolts of plasma energy, capable of a destructive yield equivalent to a standard Guyvers pressure cannon. Effective range is 1 to 5 miles, with a re-fire cycle rate of 1/2 seconds. Additionally, the arm mounted electric gun has been specially modified, from previous versions, with an EMP based launcher system that eliminates the need for the ammo to contain its own propellant. This combines with the larger ammo load carrying capacity of units armour shield to allow units to have up to 600 round capacities. Modular design of ammo storage compartments also allows these units to be quickly rearmed. -Other abilities and tools can be added depending on the combat situation the unit will be put in. The unit is also the first none Green type to be equipped with a dimensional coupler power system, for nearly unlimited range and power reserve, as a standard component of its design.